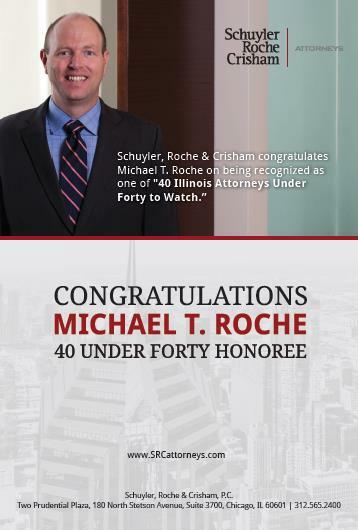 Schuyler, Roche & Crisham’s Michael T. Roche was honored by Chicago Daily Law Bulletin and Chicago Lawyer in their 2014 selection of 40 Illinois Attorneys Under Forty to Watch. SRC is proud of Mike’s having been selected for this honor from among 1400 nominations. Adam Hrejsa, Director of 40 Under Forty, writes in this year’s introduction, “This year, the competition…was more intense than ever.” 40 Under Forty named Mike for demonstrating “intelligence, passion, success in the office, a desire to help the community, and most importantly, a willingness to work hard at one of the country’s most important professions.” His clients and colleagues alike praised his integrity, respect, dedication, and skill, and the firm congratulates Mike on this significant achievement. Mike is a partner in SRC’s Civil Litigation and Financial Service practice areas, with an emphasis on complex commercial litigation and on non-compete and restrictive covenant matters.